"Our obeisances unto Swami Bhakti Gaurava Narasingha Maharaja, disciple of Srila A. C. Bhaktivedanta Swami Prabhupada, who, in the same mood as Srila Bhaktisiddhanta Sarasvati Thakura, does not tolerate even the slightest deviation in the distribution of that sublime nectar which is aspired for by Srila Rupa and Srila Raghunatha Goswamis." In the last days of Srila Prabhupada's manifest pastimes on the earth, Maharaja took every opportunity to serve Srila Prabhupada and on many occasions Maharaja stayed at Srila Prabhupada's bedside throughout the night. After the departure of Srila Prabhupada from this mortal world in November 1977 Maharaja remained in Vrndavana for four years. In 1981, Srila Narasingha Maharaja traveled to Navadvipa-dhama where he met Srila Bhakti Raksaka Sridhara Deva Gosvami Maharaja, the renowned saint and preceptor of the line of Srila Rupa Gosvami for the first time. In 1987 he returned to the lotus feet of Srila Sridhara Maharaja to officially take siksa from him. During May of 1988 Srila Narasingha Maharaja received the title and name 'Bhakti Gaurava Narasingha' from Srila Sridhara Maharaja who also conferred his blessings upon him and requested him to continue to preach Krsna consciousness throughout the world. In October of 1988 Srila Narasingha Maharaja went to Vrndavana accompanied by his dear Godbrother Sripada Bhakti Bhavana Visnu Maharaja and together they established the Rupanuga Bhajana Asrama. In 1992 Maharaja established the Sri Krsna Caitanya Asrama at Trivendrum and in 1995 he and Sripada Visnu Maharaja established the Sri Narasingha Caitanya Matha at Srirangapatna, Mysore. At present Srila Narasingha Maharaja preaches in India, USA, Mexico and Brazil. 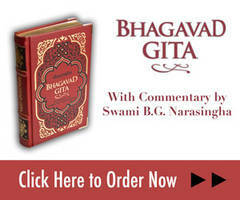 He has written many articles for such spiritual journals as Back to Godhead, Clarion Call, and Gaudiya Vedanta. His articles are regularly distributed via the Krsna Talk emailing subscription list. Maharaja has also authored several books such as Vaisnava India, Kumbha Mela, Evolution of Theism, The Authorised Sri Caitanya-Sarasvata Parampara, The Meaning of Sannyasa, Sri Damodara-katha, Sri Gayatri Mantrartha Dipika, Prakrta-rasa Aranya-chedini, as well as a commentary to Srila Sarasavti Thakura's Prakrta-rasa Sata-dusini. In addition to these literary contributions of his own, Maharaja has edited and published In Search of the Ultimate Goal of Life by Srila A.C. Bhaktivedanta Svami Prabhupada, Words from the Guardian of Devotion, Follow the Angels, Encounters with Divinity, and Upadesamrta by Srila Sridhara Maharja as well as the book Prabhupada Saraswati Thakura, describing the life and precepts of Srila Bhaktisiddhanta Saraswati Thakura. Maharaja has also been the inspiration behind Devavision Productions, producing the documentaries The Universal Teacher, Kumbha Mela and Himalayan Pilgrimage. Devavision Productions ahas also produced a series of lectures by Srila Sridhara Maharaja such as Gayatri, Absolute Harmony, Darshan, Ujjvala-nilamani, Fools Rush in Where Angels Fear to Tread and The Art of Sadhana series by Srila B. P. Puri Maharaja. Due to his straightforward and affectionate dealings with all the devotees Srila Narasingha Maharaja is held in high regard by senior Vaisnavas, sannyasis, Godbrothers, Godsisters, and disciples alike. Wherever he travels, Srila Narasingha Maharaja preaches Krsna consciousness enthusiastically and enlivens all those who come into his holy association.